We, the Global Sri Lankan Forum, GSLF write to convey our grateful thanks to you on behalf of the threatened Sri Lanka for you excellent presentation of facts at the recent “All Party Group” debate on Sri Lanka. You have been contributing your unbiased views on Sri Lanka in the past without being pressurized by or caving into the lies and distortions spread by the separatists who supported the LTTE terrorism , so called NGO fronts and the politicians who are swayed by the vote banks of persons of Tamil origin in the UK and other countries. For them the parroting of all the anti-Sri Lanka slogans and the false stories of perceived discrimination of Tamils, the exaggerated number killed at the war against LTTE terrorism and attempting to create instability in the small but a country with a long and proud history of being a unitary state is the unwavering agenda. With the present Sri Lankan government accepting the UNHCR resolution moved against the country in the guise of reconciliation ,Sri Lanka has been placed at an unenviable position. As you recollected in your speech, the threat of war crimes on Sri Lanka should be removed for the country to progress with confidence. We send herewith an article written by Mr HLD Mahindapala, on this important subject to identify the false story of Temil grievances. 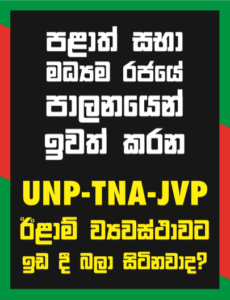 We take this opportunity again to thank you for relating the true story of Sri Lanka in the public arena and request you kindly to continue your invaluable contribution to highly prejudiced case championed by the anti Sri Lanka fora.